snow pack | Alaskan at Last! At that time there was approximately 34″ of snow pack which had increased to 38″ after a snow event the next evening. 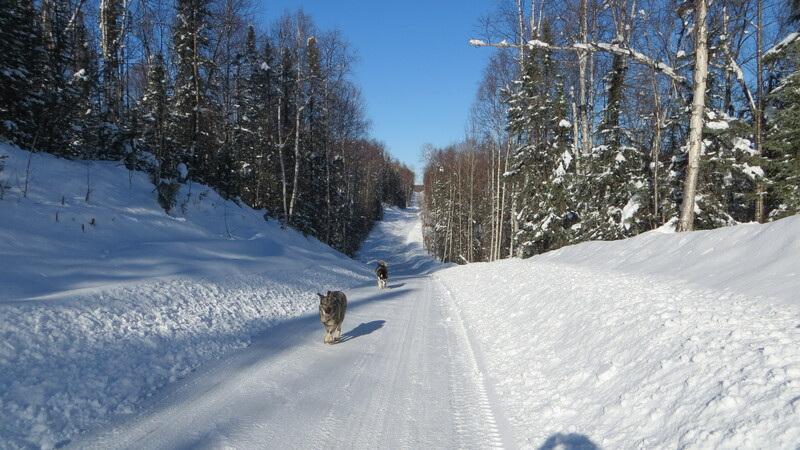 I was informed by my realtor and good friend, Holly, that these conditions were pretty typical for early to mid-April in Talkeetna. Here’s a picture I just snapped maybe fifteen minutes ago. It is just three years and three days from the date of the previous image. Without question the difference in the snow pack is both startling and revealing. 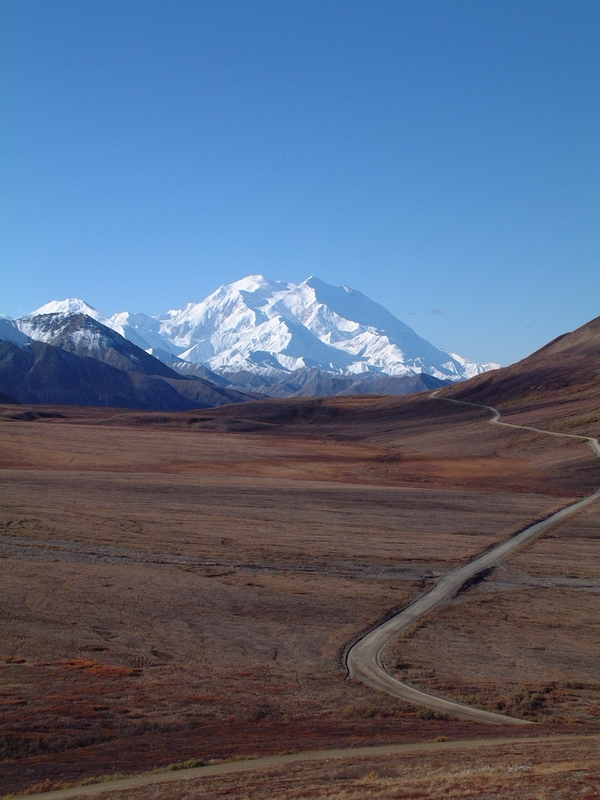 Since the winter of 2012-2013, which set records for snow fall across much of Alaska, Talkeetna has seen three consecutive warm and dry ‘winters’ all of which have set records in terms of warmth. 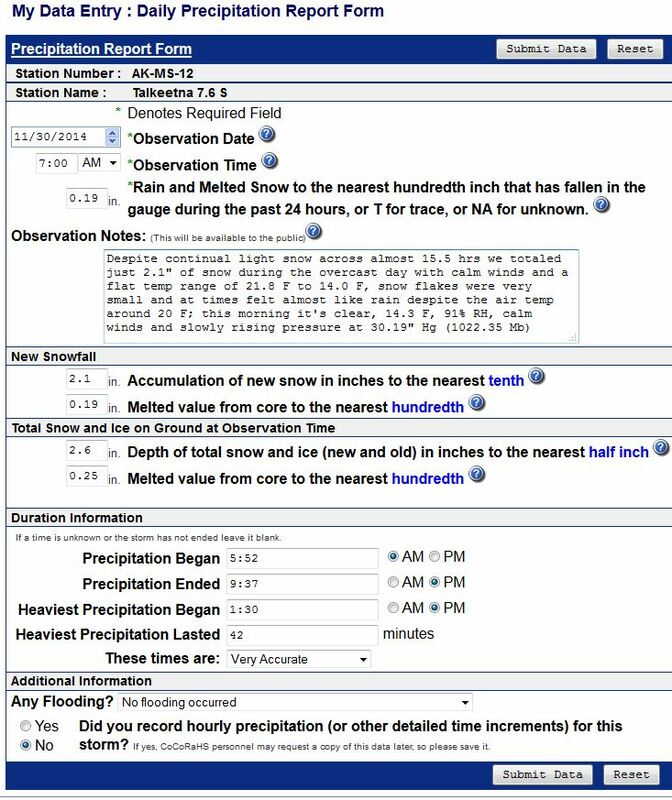 This report looks much more like those I generated while living in SW Ohio or even SE Michigan when we were lucky to even see accumulating snow during many winters. I’m beginning to believe I somehow redirect winter weather away from where ever I choose to live! 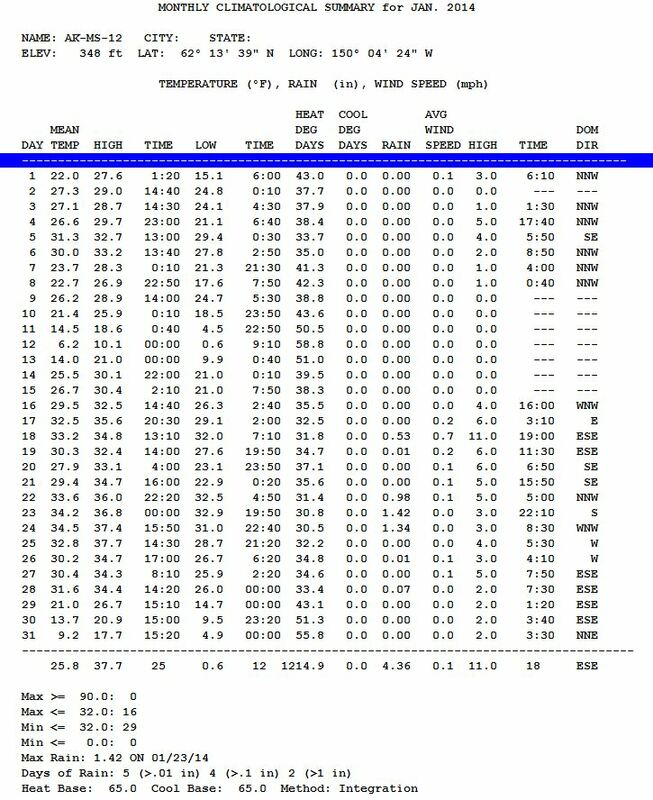 This sounds like nonsense but you must realize for the four winters I lived in SE Michigan (2009 through 2013) there was almost no snow; the final winter (2012-2013) we totaled just 9” of snow all winter and never saw a temp below 0 F. I move out in July of 2013 and the next winter sets an all-time record for snowfall at Detroit’s Metro airport and also sets numerous low temperature records during the season. Meanwhile, Talkeetna has its warmest winter on record as does most of Alaska. And this year is looking much the same. 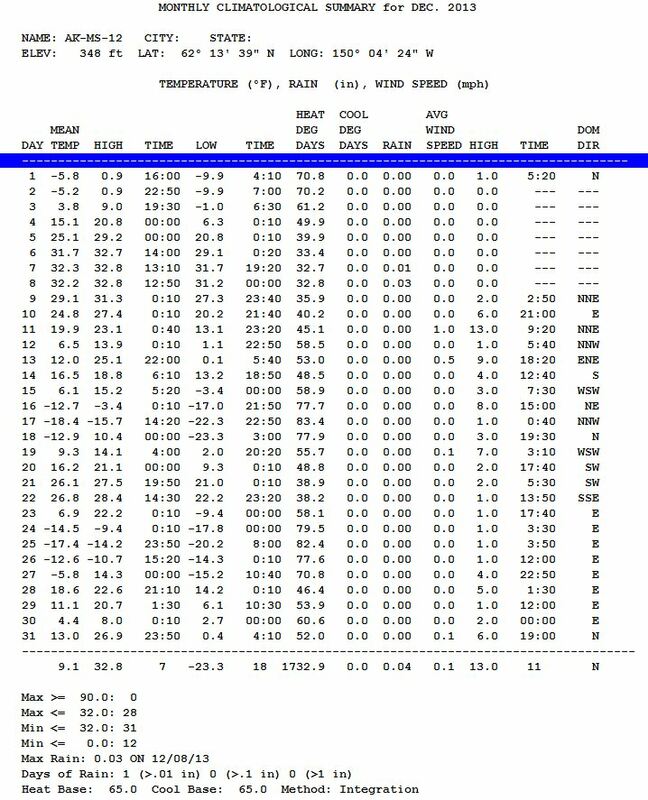 Unbelievable that Talkeetna’s average temp for January 2014 was 25.8 F and its low was just 0.6 F!!! 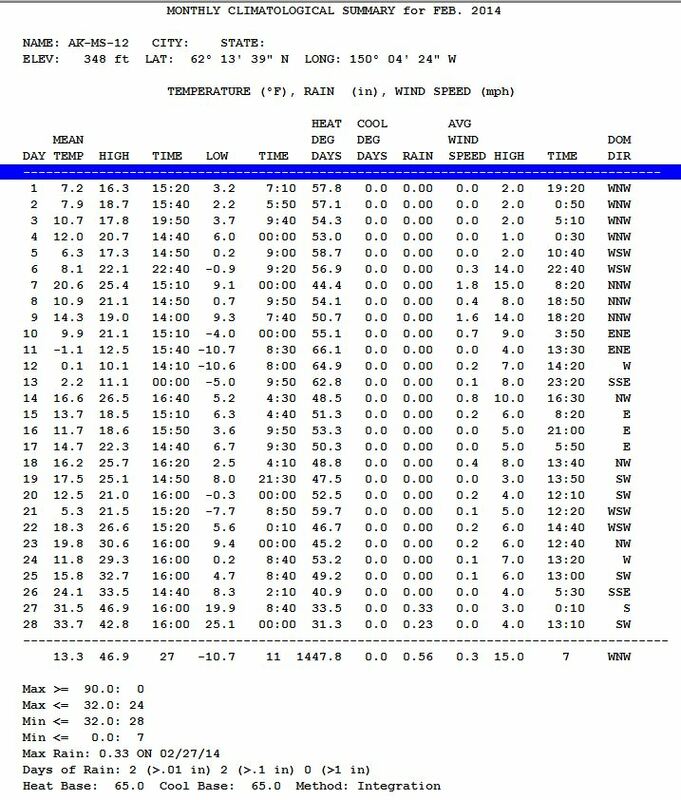 December and January are the two coldest months up here but you wouldn’t have known that from the above data. And it appears we’re heading for another such ‘winter that wasn’t’ this year. 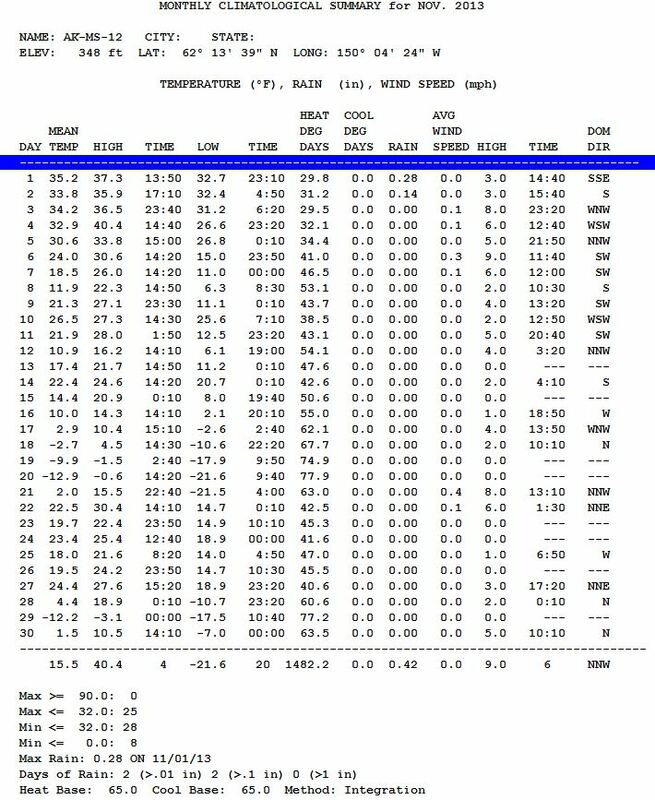 Part of the reason I moved to Alaska was to experience five plus months of real winter with feet of snow pack and days of temps never reaching 0 F and dropping into the minus twenties or even minus thirties. At this juncture to say I’ve been disappointed would be a bit like calling Denali ‘a big hill’! I realize that technically winter has yet to begin although meteorological winter does start December 1st and runs through March 1st so for all intent and purpose we are now in the winter season. I certainly hope we see a true shift in our winter back to the more normal temps and snowfall for this area but to this point it doesn’t look good. 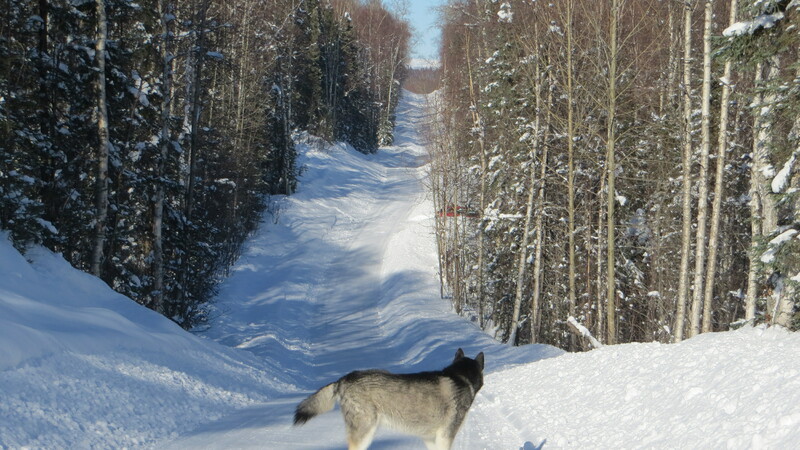 If this continues I may have to do the unthinkable and move to Fairbanks or points north just to see an Alaskan winter. After the grueling move up here from SE Michigan I swore I would never move again yet if I cannot find ‘winter’ here I may just have to swallow that promise and look north. Alaskans from the further north reaches joking refer to this area as ‘the banana belt’; sadly to this point that moniker is all too accurate!